Celebrate Our Freedom and Those who Fight for it! I am so thankful that I am free. Free to choose my path, free to choose my husband, free to choose how many kids I will have, free to choose how to raise them, free to choose what religion I am, free to choose period!! Although at times I think it might be easier if someone was at my side demanding that I choose certain things.....I am thankful that I do have that choice to make on my own! Jason's cousin JB recently returned from serving in Iraq. I causally said "So, how was the WAR?" He answered "Well, it's not a lot of fun getting shot at everyday!" WOW! That gave me chills and made me see the reality a little more. What a service to us as Americans that we have so many soldiers of wars like JB out there to defend our Freedom. They lay their lives on the line so you and I can make our "Own Choices". They leave behind their family so you and I can have the freedom to choose our path. They leave their jobs and their lives behind so you and I can worship how and who we choose. JB, what an honor it is for us to know you. Thanks you for being so brave and dedicated to America! This is to funny not to blog about. I turned on my camera to make sure I'd downloaded all the pictures so my camera would be ready for the 4th of July and I see about 15 pictures of Taylor that she had taken herself. This is just one of the funniest ones that were on the camera! When I asked her about it she just smiled and laughed as she walks away! Can you believe that little angel face can look so silly!?!?!?!?!?! We were at Riverside Country Club for swim lessons. After Karson, Taylor and Cooper (nephew) finished their lesson, Karson wanted to go off the diving board. He'd gone off the low dive several time last year and a few times this year. The day before yesterday he wanted to see if he was tall enough to go off the high dive. Well, he was tall enough. Karson grinned from ear to ear, so excited and feeling pretty big and independent. Karson went off the high dive the day before yesterday a few times with no problem. Karson, feeling pretty cool wanted to show everyone how he could go off the high dive. Their was a lot of people to impress with his courage. Aunts Crystal & Andrea, Nanny Camberlango, and cousins, Jordan, Little Jo, Cooper, Hailee and Sadie and his sister Taylor were all their. We weren't going to stay and swim yesterday after swim lesson because I was watching Mandy's (sister in-law) kids. I told Karson he could go off the diving board then we'd have to leave. He went down and decided to go off the low dive. He jumped off and felt pretty cool. He wanted to do the high dive once before we left. He walks over waits his turn. He proceeds to climb up the ladder to the high dive. He was almost to the top. We think he was 2nd stair to the top when all of the sudden my little guy loose his balance. Sort of rolls down the stairs and lands on the cement!!!!!! His back lands on the curb of the platform where the high dive connects to. 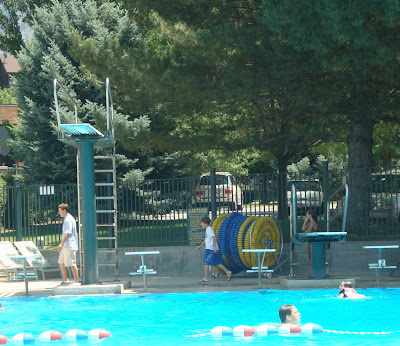 To make it a little more clear of a picture the high dive is 12 to 13 feet tall. The bottom of his feet were about 9 feet from the ground. I was standing no more than 5 feet away from him when it happened and could not caught him. As my little guy laid there not moving (but still talking) My heart hit my stomach! I didn't dare to pick him up. As my Mom, me and lots of the cousins surround him, some medical staff come to help. Karson wouldn't move his neck, legs......nothing. We were terrified. Then a few minutes later he just stood up!!! Instantly, the relief come over me to see him stand and walk. We went to the Life Guard station and they fixed up his elbow that was bleeding. Karson didn't cry the whole time. Whimpered after it happened and said it hurts so bad but didn’t cry....Jordan his cousin said “Man Kars you’re the toughest guy I know” It was really cute. I took Karson to the Doctors because..... I’m paranoid. The Doctor said that his spine was fine and he’d be okay. Just some soft tissue bruising. So anyways, It scared us to say the least. Riverside told him that because he was so brave they wanted to treat him to a lunch and an ice cream. Karson was way excited that he didn’t even have to give them any dollars for it! I think that made it all worth it for him LOL! Riverside said Karson would be the first person ever to have fallen that high and not broken anything. We are pretty thankful for that and for Karson. Thanks for your help Mom! So glad you were there!